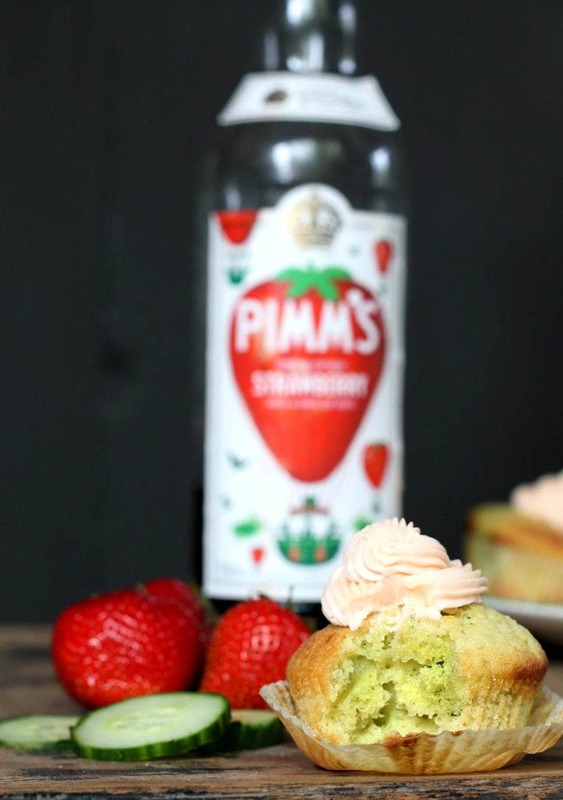 These lemon and cucumber cupcakes are topped with a boozy Pimm’s Icing! The flavour of the cucumber is subtle in the lemon sponge. Cucumber and lemon in water is lovely, isn’t it? But let’s leave that to the health spa brigade for the moment. Let’s take those lovely, fresh flavours and turn them into cupcakes! The delicate cucumber flavour is subtle and pairs well with the zingy lemon. I’ve topped it with a slightly boozy Pimm’s icing. Detox water in cupcake form, with a boozy buttercream. Because we all need days of decadence. Pimm’s is a quintessential British alcohol with a summery fruit taste. It’s usually paired with fizzy lemonade (the UK kind, like 7up or Sprite) and poured into a glass packed with strawberries, mint, cucumber, lemon and ice. They recently came out with a strawberry and mint flavoured Pimm’s so I’ve used that in this icing, though the traditional one works well, too. If you can’t get hold of any Pimm’s, try using any fruit punch that you like. 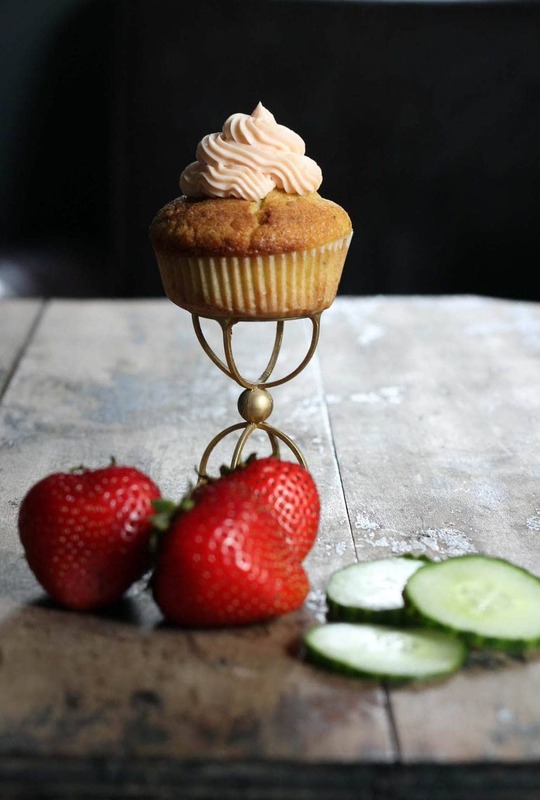 A fresh and delicate lemon cupcake with a hint of cucumber flavour. Topped with Pimm's icing. Pimm's is a British alcoholic drink with fruity flavours. If you can't find it, substitute with strawberry juice. Preheat the oven to 170C/325F. Line a 12 cup muffin tray. 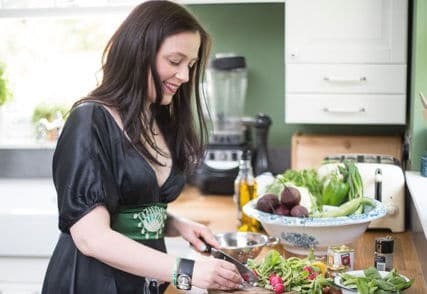 Leave the skin on the cucumber and de-seed it by cutting it in half lengthways and scraping the seeds out with a teaspoon. No need to be too thorough – it’s just to make sure it isn’t too watery. Cut into chunks and puree until smooth in a blender. Stir in the lemon juice and zest. Cream the butter and sugar together for a few minutes until pale. Add the vanilla and then the eggs, one at a time, beating each one in well. Stir in ⅓ of the flour (with the salt), then add ⅓ of the cucumber and continue alternating until it is all combined. Bake in the preheated oven for 12-15 minutes or until an inserted skewer comes out clean. Allow to cool slightly in the tin then cool completely on a wire rack before icing. Beat the butter, icing sugar and Pimms together until smooth and fluffy. Add more Pimms if necessary to make it a frosting consistency. Keep in the fridge until ready to ice the cupcakes. This was a big hit with friends and family. I adore Pimm’s. Its the quintessential taste of summer. Intrigued to try the Strawberry version now. 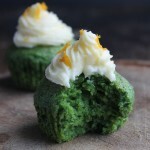 Well these sound very good, but you’ve got me at Pimms infused spinach shortcakes – wow!!! This is brilliant! Love the creativity (and awesome flavors – cucumbers & Pimms! 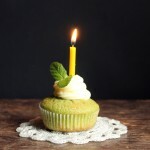 In a cupcake – yes!!)! Hi Kate! 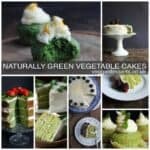 I’ve never heard of cucumber cupcakes until I saw your post in Enjoying Yummy Recipes…! Thanks for sharing your love of vegetables through this site! I quite happen to love cucumber water, but then I also love Pimms so I think this recipe is a real winner. So different too. I’m trying to imagine what it tastes like! Beautiful pics too! This is so innovative, I would ave never thought to add these flavours in a cup cake. I love Pimms! Haven’t tried it in baking yet but these cupcakes look and sound delicious. Must hunt down that new flavour though I doubt there will be any leftover to use in cupcakes. Oooh – I do like the look of those! And the fact that you mention detoxing and decadent icing in the same sentence ;o) This is what I call a balanced diet! These sound great. I bet the cucumber adds a nice light freshness to them. 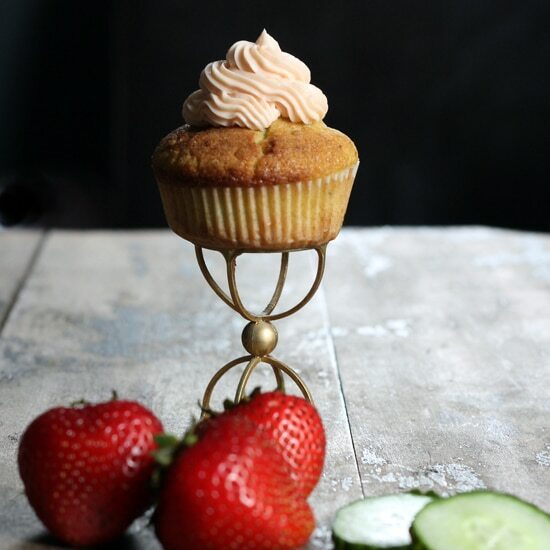 What a gorgeous cupcake and recipe! Pinned and shared! What refreshing fruits in a beautiful cupcake!! I absolutely love this idea!! Beauties! If only sunshine came in bottles too we’d be sorted!